So I got this from @Bigshizza and finally got to smoke it. 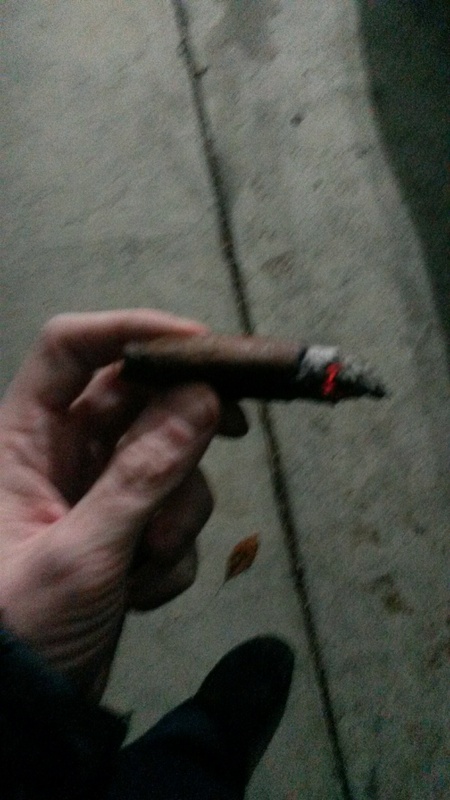 The weather has been nothing but rain and wind, so at 1am it finally died down and I pawed through the box to see what I could smoke quickly before bad weather hit again. The Viaje was so small and just staring at me. Everyone has had good things to say about them so far, so I figured it would be a good cigar. I have to say I wasn't sure what to expect. Smell wise it seemed a bit earthy with some cedar to it. I cut the end and took a taste and got a bit of nuttiness with the earthiness I smelled in it. I toasted the foot and lit it up. Right away I was hit by an earthy, leathery taste with a hint of sweetness. I will say I was blown away. It was damned good from start to finish and I was sad when it ended. The earthiness died away around the half way mark, which in such a short cigar didn't take too terribly long. The draw was nice and even the whole way through. The burn rate was solid and I noticed that with my tendency to smoke quickly, I was getting quite a stem on the end, so I slowed down a bit and it actually improved the taste. Though that last bit could be my imagination. Down towards the tail end I got a bit more of the sweetness and a ton of the leather. I puffed on it till it threatened to burn my fingers off, I was really tempted to come in and get one of those poky style "corn holders", which is what the nubbers I have seen around here remind me of. But then I remembered we don't have any. So I had to let it go. (the first guy to start singing is getting stabbed). I'd smoke it again. If you could just roll me a few of these that are 6 feet long that I can spend the entire day tasting the goodness on, I would buy them by the truck load. I'm not sure how many people have had them, but if you haven't and have a decent palate that can find those 3 flavors in it, I highly recommend it. I'm looking forward to trying other Viaje in the future. They've definitely made a fan out of me on this one, especially if the rest of their line holds up to the quality of this one. The friends and family is one of my favorite Viaje. I didnt get any of the limitada though. The friends and family is one of my favorite Viaje. I will be eagerly working to get a hold of any others. It was really good.